Welcome to Mandolin World Headquarters, the #1 ranked vintage mandolin company by Yahoo and Google! If you are interested in purchasing a used mandolin or vintage mandolin, our hand-picked selection will satisfy you. All of our instruments are played prior to purchase and our inventory changes all the time. If it's a vintage Martin or Gibson acoustic mandolin or guitar you are looking for, we only offer the best, so check out our selection and I'm sure you will find something that catches your eye. We sell stringed musical instruments, specializing in mandolins and guitars. As one of the major online vintage mandolin dealers in the United States, we have high standards for every instrument that we take in. I will not buy an instrument that I would not play myself. There are cool instruments at all price points. I do understand budgets and that not everyone has the means to buy a Loar. That does not mean you have to settle for junk, however! Not only do we buy, sell and trade but we play as well. We do a lot of trading and will consider almost any quality stringed instrument you offer. Perhaps a Fender Stratocaster, Telecaster, or Jazzmasteris your thing. Or maybe you're a dedicated Les Paul or SG player. These and many other fine vintage stringed musical instruments can often be found on this web page. The selection changes frequently,and cool instruments arrive on a regular basis. Keep reading for great deals! I'm Charles Johnson of Richmond, Virginia, USA, and the following is a list of instruments that I have purchased or traded for over the last year or so. I do a lot of trading with just about any quality stringed instrument (no pianos!). Prices are somewhat flexible on certain items, depending on the piece and how much I'm wanting something else I have my eye on! Digital images are available for all instruments - just click on the camera icon or the underlined name. Photographs are also available by regular mail. If you are interested in something we have or are considering selling/trading/buying, please feel free to make an offer (hopefully reasonable) on anything listed. I always appreciate the chance to do some business, even if the deal doesn't work out. If you see something you like, email, fax, or call me between 10:00 am and 10:00 pm eastern USA time zone weekdays or 12 noon until 10:00 PM on the weekend. Thanks! Lots of new goodies - please check the listings on the main page. Click here for the "Recent Arrivals"list. Click Here for more detailed ordering information. Confused by the terms "A style" or "snakehead"? 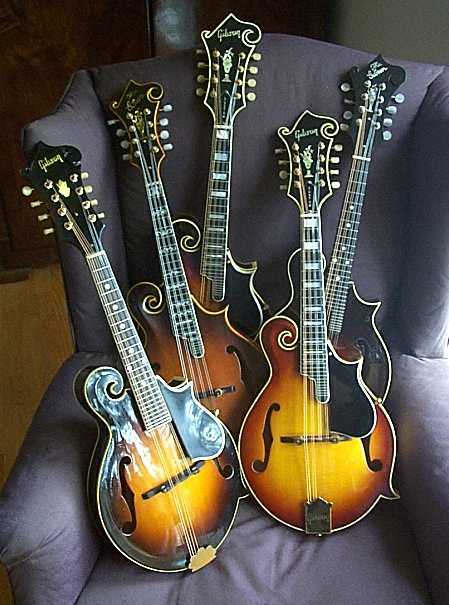 Click here for a guide to types of Gibson mandolins and the terms used to describe them. Do you have an old bowlback mandolin? Click Here for information on bowlback or "tater bug" mandolins. Click Here for a scan of the FRETS magazine article on Kentucky KM-1500 and KM Dawg mandolins. Click Here for information on Appraisals. Trades of better quality US made instruments are welcome. I don't think anyone should have to buy an instrument unheard and sight unseen, so for mail order or online sales I offer an unconditional approval period for 48 hours after receipt of the instrument. If you want to return the instrument, call during this period and tell me. All returns must be insured and shipped at your expense. I will refund the selling price of the instrument as soon as I receive it in the same condition as it was sent to you. Local sales are on an appointment basis. I buy instruments! Please email details of what you have for sale. Be sure to include your phone number so I can contact you to work out the details. That's it. A hassle-free transaction is guaranteed. Mail order, national dealer, local customer, and online references available. Keep pickin' and grinnin'!! Hope to hear from you!